Are You Homeless? | HomesNow! HomesNOW! is dedicated to housing every person who is homeless, starting with Whatcom County. We are funded 100% through private donations (we do not receive taxpayer money, grants or any other public funding at this time) and the demand for our services outstrips the supply of current funding. But there may still be a way. 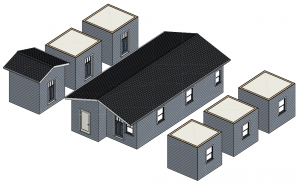 We can tell you that it costs us about $3500 on average to build a structure that is the size of an 8′ x 10′ bedroom, with modern insides like a normal bedroom in a house. For electrical we would need to hook it up to an existing house, or RV electrical. For plumbing, we would need to place the structure near an existing structure which has bathrooms, like another house. We are also working on acquiring land in order to refurbish boarded up houses and use them as transitional housing. If you know somebody who can sponsor you or provide the land/house/money for us to get started, we can get started right away. Our only barrier is the donations we have in order to buy the supplies. In order to gather accurate data about homelessness in Whatcom County and for us to keep a database of who needs help, so we don’t lose track, we would like you to fill out the questionnaire below. We will also use this to contact you for an interview or when housing for your specific situation becomes available in the future. Please fill out the form below, you will be added to our database of people who need housing. Not Homeless. In danger of becoming homeless soon though. Do You use the Mission? Would you be willing to tell the City/County council your story? What would help you right now to be more comfortable? Where did You serve? How many years? Would you like to call anybody right now to let them know you're alright? In order for us to increase public support for solving the homelessness problem, we would also like to conduct interviews with you based on these questions. The purpose of the interviews (100% optional) would be to share your story online through our YouTube Channel and Social Media to tell your story so people can see that people become homeless for various reasons and to break down any stereotypes or preconceived notions they might have about it. When people see real stories and real people being affected, it has the potential to change their point of view.